Honesty is the best policy. True in the long run but oh so difficult to practice at times. Just recently, Kenzie has been caught telling lies. Mind you that she is a sassy 4 year old girl who seems to be the leader at preschool. She tells a lie to gain something - 95% of the time it's a piece of candy. Although not harmful to anybody, Hubs and I realized that we needed to do something about it but didn't know where to start. The Principles of Our World collection of books from Harvest Time Partners provided just the answer. There are currently 6 children's books in this collection: Honesty, Teamwork, Sacrifice, Hope, Courage and Compassion. Each book introduces the principle and then showcases it in a story situation that is applicable in real life. Parents can read one story at a time or the entire book. 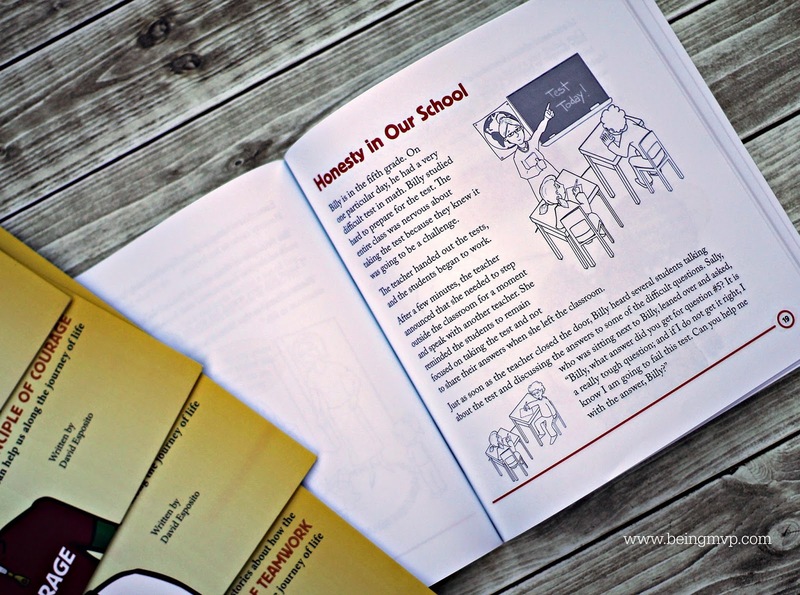 At the end of each book, there are questions to ask your child on what they would do in certain instances. I love this interactive set of books that make learning about principles of life fun and easy to understand. Encouragement and understanding is the key to teaching your child how to be honest along with other life lessons. Although Hubs and I think it's hilarious that Kenzie tries to weasel certain things by going from one parent to the other, we need to put a stop to that and teach her the basics of being honest and how that can lead to a reward. 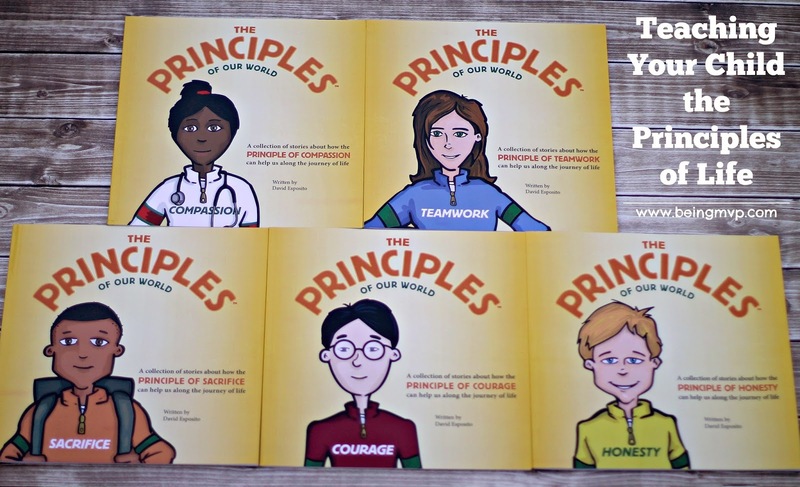 Since Kenzie loves to learn and read, this medium of the Principles of Our World books is a great way for her to see how to apply various principles to real life situations. Even though life is tough, with the applications learned in these books, Kenzie (and eventually Mason) will be able to decide how to react and act in the right way. 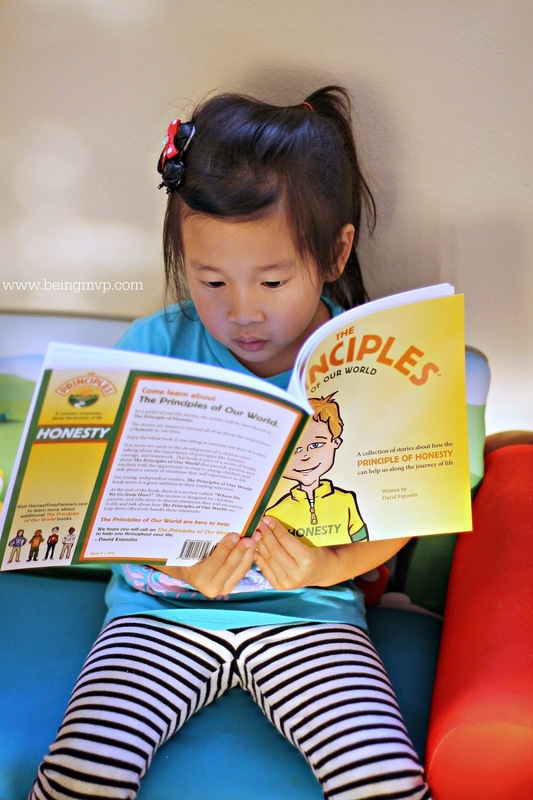 One winner will Receive Kit of Harvest Time Partners The Principles of the World books! My children are only three and five so we have not really encountered this properly yet. My older son has sometimes attempted to lie to cover up something he knows he will be punished for but he is dreadful at it and I spend a lot of time explaining why lies are bad. We have been trying to teach dd about courage so that if the need ever arises at school she will have the courage to stand up for herself...or other students...if she is ever bullied or witnesses it. She is already very compassionate - we just need to work on her shyness/scaredness (I know that's not a word! LOL) when around people she doesn't know very well or those in authority (like a teacher). My son was with his friends one day and I was in the garden and his friends all of them started making fun of a kid that was walking past them and they kept on and kept on, The kid started crying and my son whom was not picking on him went over to him and said its ok they are dumb. and they both walked away! They are still great friends and Now his friends like him too. When my daughter was younger, we wanted gum from the store and I wouldn't get it for her. She took it anyway. When we got home, I saw her take the gum out of her pocket and I asked her where she got it from. She was honest and told me she took it. We went back to the store and gave it back to the owner. She was mortified but he gave her a hug for being honest and she learned a valuable lesson. My daughter just started kindergarten and shes been having some problems following the rules. According to her, when asked who started it or who did something first, its never her. I could really use these books! I am a little embarrassed to speak of this but I will. I just love browsing the craft store. I had our then 6 year old daughter with me. Just her and I looking around. She spotted this tiny little jointed stuffed teddy bear. It was only around 2 inches tall. When we left the store and I was helping her get buckled up out of her pocket popped the tiny teddy. I marched her into the store and made her tell the manager what she had done. She promised never to steal again. When we arrived home I gave her a pencil and paper and had her write an apology letter to the store. She also wrote a little story about her thoughts on what it would feel like if someone stole something from her. To my knowledge she never did steal anything ever again. We had a conflict between my hubbie & I. He felt that I embarrassed her by making her go back into the store and confess what she had done.I stand firm in my decision. It may be harsh but I could not bear raising a thief! I would do anything to keep that from happening. My great niece was scared of the life size Chuck E. Cheese character when we went to lunch at that restaurant one day. She screamed and screamed that she wanted to go "bye-bye." My sister and I held her and sat her in a booth far away from the character. She wasn't thrilled, and kept crying. We finally decided to ask her what would help her and she said "go out," so my sister told her they would go to the car and get the sippy cups. That helped her alot; she stopped crying and started to walk with my sister to go outside. When they came back in, we made sure she didn't have to walk by the character and we let her choose where to sit. I know that we manipulated the situation, however, if that was what it took to make her feel safe and comfortable, I'd do it again for her. My son tore a library book to see how it came apart. He felt guilty and let the librarian know he did it and offered to pay for it with his piggy bank money. The librarian mended the book and he felt better.